[prMac.com] San Jose, California - Tekton Technologies today is proud to announce that Orderly - To-do Lists, Location Based Reminders 3.2, has been featured by Apple on the US App store, and has topped the charts the productivity category. 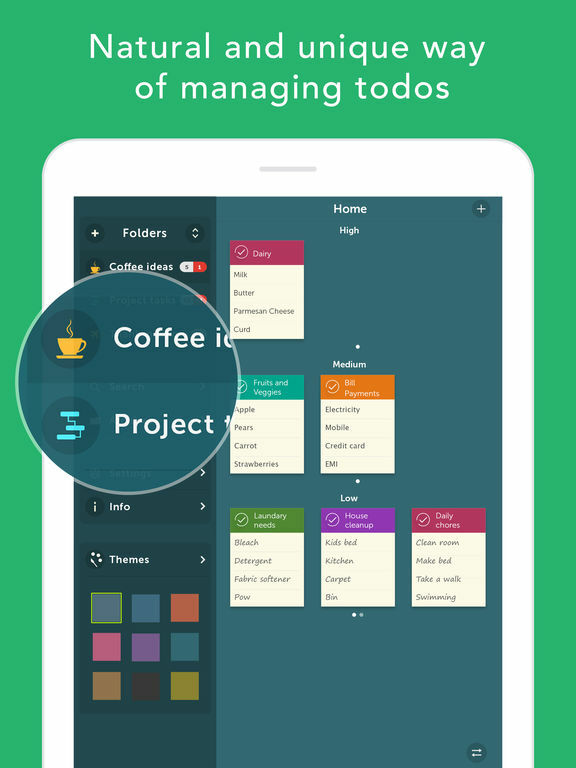 Orderly features unlimited folders, location based reminders, archiving of notes, cloud sync and awesome themes. Offering nice simple gestures, multiple font sizes, the ability to set due date for individual items as well as the entire list, and location based reminders, Orderly makes sure that a task never goes unnoticed, when you are at a particular location. Once a to-do is created, it is displayed on one of three shelves using Apple's bookshelf metaphor: High Priority, Medium, and Low. Users can instantly view all their to-dos, expand and contract them with pinch gestures, edit items, change their priority, mark them as complete, or swipe them to delete. The app includes two full-screen bookshelves, Home and Work, allowing users to keep To-Dos posted according to priority and location. The extraordinary simplicity, practicality, and design of Orderly sets it apart from the many to-do apps available. Having concluded that pinches and swipes are ergonomically more efficient than taps (which require hitting a target button), Tekton Technologies has employed the fundamental principles of human factors to design a to-do list app that is highly efficient, instantly informative, and accommodates to the daily needs of real people. With its intuitive gesture based commands, the learning curve for the app and all its features is about one minute. "Orderly," offers the most natural way to create your To-Do lists using simple iPhone gestures," states Tekton Technologies. "All your tasks and to-dos are presented as simple visual list notes, so that you can create to-dos and post them on your board. This App allows you to prioritize your to-do tasks, without the hassle of misplacing a note or forgetting an item, just because there are too many to-dos to manage. The best part of the app is that Orderly automatically prioritizes your to-dos by moving around those list notes." Orderly 3.2 is now available at a price of $0.99 (USD) and available worldwide exclusively through the App Store in the Productivity category. Review copies are available on request. Tekton Technologies is a software technology company that focuses on lifestyle enhancing iOS Apps, for users. The company has developed great Apps available on the App Store for iOS devices and has a great user base for their Apps. Copyright (C) 2017 Tekton Technologies. All Rights Reserved. Apple, the Apple logo, iPhone, and iPod are registered trademarks of Apple Inc. in the U.S. and/or other countries. Other trademarks and registered trademarks may be the property of their respective owners.